Each process of work I engage in with the fungal kingdom continues to remind me of how similar we humans are to our fungal allies. Thus far, on this blog I have brought up research that I have collected on the various mushrooms, and barely touched on the different levels of medicinal preparations that I have been experimenting with. 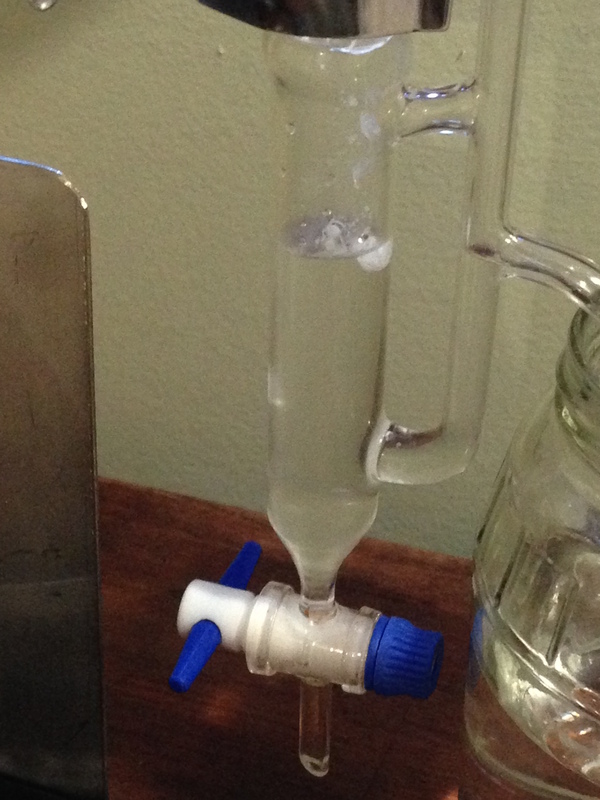 Most recently, I have been experimenting with polypore distillations. This magnificent mushroom was collected early in the day, chopped, and then vitamixed (high speed blended into tiny fibers). After the body of the mushroom was processed into the smallest pieces possible, it was added to a 2L flask. considering the limited information on the volatiles of G. applanatum, I was skeptical if there would be any oil collected at the end of this process. There was one paper I found in the journal of Essential Oil Research that tested for the essential oils of G. applanatum. 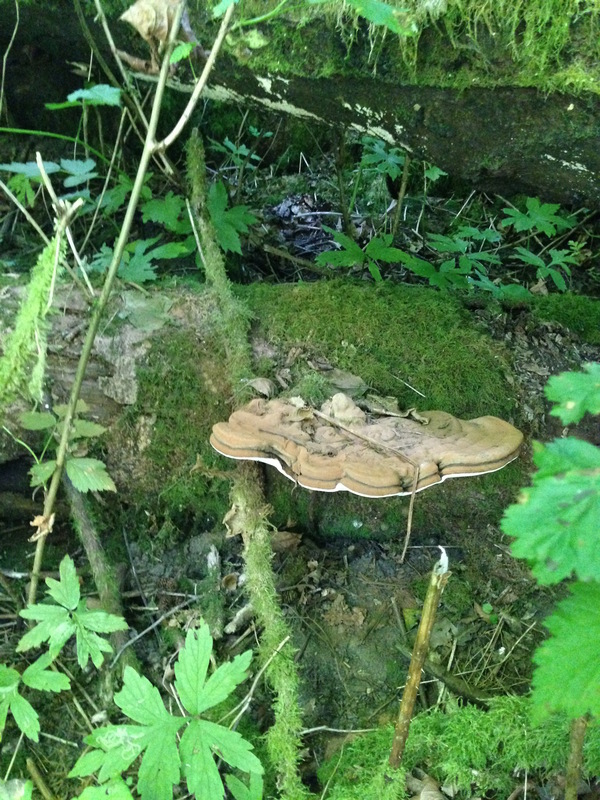 The paper, “Volatile Metabolites from the Wood Inhabiting Fungi Bjerkandera adusta, Ganoderma applanatum, and stereum hirsutum” by Ziegenbein et al. found 22 volatile compounds that could could be identified, with R-(-)-1-octen-3-ol (Octanol) and phenylacetaldehyde being the major constituents of the oil. Other constituents found in amounts between 5-10% are (E)-2-octenal, (E,E) 2,4-decadienal, 2-nonenal and 5 ethyl cyclopentene-1-carbaldehyde. This is the first time that 5 ethyl-cyclopentene-e-carbaldehyde has been found as a fungal metabolite. Octanol, also known as mushroom alcohol, is a chemical that attracts biting insects, like mosquitos. It can also be found in human breath and sweat. Maybe this is why the mosquitos love me so much…you could probably make a trap using the volatiles, put a bowl out with the hydrosol or a little oil and the mosquitos will go to that instead of to you. I would suggest not spraying yourself down with the hydrosol before walking through the woods. Octanol is found in many edible mushrooms and also Lemon Balm, Melissa officinalis. There is also small mention of it’s use in perfumery. In my experience with smelling the volatiles from this mushroom the scent is reminiscent of spicy, yet sweet decaying earth. ( A hard to find smell in the world of perfumery) There is also research being done on using octanol to treat involuntary tremor disorders. Phenylacetaldehyde is found abundantly in nature, it is a derivative of the amino acid, phenylalanine. This can be found in chocolate, flowers, and certain insect pheromones. It has also been used to flavor cigarettes and added to fragrances to add a grassy-rose like flavor. (E) 2-octenal is used as a flavoring agent in food industry, said to have a nutty flavor, and is mostly found in fungi and lamb. Also, one of the major constituents in the stink bug stench! 2-nonenal is an important aroma component in aged beer, and according to wikipedia the smell that comes along with the aging of humans. After about an our of distillations, the fumes filled the air of my house, and my eyelids felt like bricks. complete exhaustion came over me and I napped for most of the time the distillate trickled through. This has been the strongest sedating effect I have felt from any substance I have encountered. It felt painful to stay awake. I suppose there is implication for the hydrosol to be used as a strong sedative. Since then, I have sprayed the hydrosol throughout my home before bed, and the sedating effect is still there. Ganoderma species have a history of use as a sedative, so this was no surprise. After 2 hours there was a build up of fatty emulsion in the condenser and it slowly fell into the oil separator. Hours went by, and the thick white substance continued to build up in the condenser. After turning the water off, the build up in the condenser fell in to the oil separator. The cold water running through the condenser was keeping it in a more solid form, and when the condenser warmed it softened and fell through. I thought it would potentially liquify at room temperature, but it stayed as a substance the consistency of lard. This smelled extremely aromatic; Decaying forest with coinciding notes of sweet and pungent. I ended up collecting 20 oz of hydrosol and about a teaspoon of the lard-like substance. I had a taste of the water left over in the boiling flask, strongly infused with the water soluble components of the mushroom, and it seemed to be the antidote to the sedation. It awoke me in a flash. Mushroom medicine is amphoteric medicine. If your immune system is suppressed the mushroom medicine will stimulate it, if it is overstimulated, the mushrooms will suppress it. This is the same with the energizing and sedating qualities of the Ganoderma sp. This experience is suggestive that I have separated these two qualities. If anyone has any interest in working with this hydrosol in perfumery let me know, I am happy to provide it, as I know it is not easy to find. The soul/volatile sulfur of G. applanatum is substantial. It is comforting, strong, balancing and grounding. A supportive and tenacious ally. Anna, Hi. Great to read this. I just saw you last night out the window on the street in Ballard! I’d be totally curious to try the hydrosol to see if it would help support a good nights sleep! Still in love with the mushrooms. I think I made way too much of the red belted polypore dual extraction, and should have saved some of the dried mushroom. I guess my friends will just be lucky this fall! Let me know if you have some to share. Are you still on for Sept 5th (even though it is Labor Day weekend?) I have the workshop with Lauren on my calendar. I do have some hydrosol available. $15.00 for 4oz. Class is still on for September 5th, at Dandelion Botanical! Hope to see you there. You can sign up in the store, space is limited to 12 people. great article! So, do red reishi and black reishi have the same constituents as the white reishi? Haha we’ll have to find out, Brian! Have yet to distill either the red or black.